By Rishi Patel (Digital Marketing Co-ordinator, Sage Accountant’s Division). I joined the Sage team at the start of October, and it didn’t take long for me to realise how excited everyone was about the ‘secret new cloud product’. While having my induction meetings with members of the team there was one product name that was sure to be mentioned – ‘Sage One Accounts Extra’. Seeing everyone hard at work myself tells the whole story of how much passion and effort has really gone into creating the whole Sage One suite, and how much we can’t wait to share the new addition with the whole world. This is a product we want to make a fuss about. So to kick off the fun, mysterious clouds descended from the ceilings of our offices. Not everybody knew the details but the cardboard clouds certainly made it obvious that this time around we were doing things differently. During the weeks before launch, I saw all sorts of freebies turn up at the office. 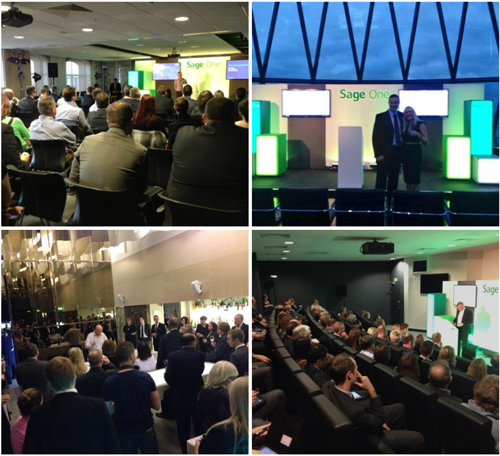 They all weren’t just for us though… The #SageOneWorld tour involved a team of us travelling across the country from Scotland to London, giving a sneak preview to accountants at amazing venues high up in the clouds like London’s The Gherkin and Cloud 23 in Manchester. The response from accountants was positive enough to prompt emails from the team sounding very excited. Launch day arrived and because this is such a blockbuster product, many turned up as movie characters. From Forrest Gump to Jigsaw to Wall-E, the excitement grew as we all headed to the popcorn stand and photobooth. I feel the internal launch event was a great celebration of the creators, developers and marketers who have been working so hard behind the scenes. We’ve had plenty to get involved with including completing tasks for a rather cool Sage One hoodie, but the rest of the Sage One Accounts Extra journey is over to you. Oh, and in case you want to see for yourself what all the fuss is about, take a look at our brand new Sage One Accounts Extra page (if you’re a small business owner) and the info on our Sage Exchange site (if you’re an accountant or bookkeeper).